Shah Rukh Khan and AbRam are having so many adventures in Europe! Shah Rukh Khan is vacationing with his youngest son AbRam in Europe and filling up Instagram with jealous-worthy posts of all the adventures the duo are checking off of the list. Skiing was one of the things that AbRam, who is all of four, and 52-year-old Shah Rukh Khan wanted to do. If you're wondering if the four-year-old actually managed to ski through the snow carpeted Alps, SRK has an update for you. "A lovely holiday climaxed with the new Speed Skiing champion of the world by my side," is how he captioned a selfie with AbRam. Both Shah Rukh and AbRam sport skiing gear in the photo but what steals the show is AbRam's Speed Ski World Championship trophy. Good job, AbRam! Shared on Friday evening, Shah Rukh Khan's photo with the 'skiing champ' garnered over 1,75,129 'likes' and 2015 comments in less than an hour. Here are more glimpses of the vacation from Shah Rukh Khan's Instagram, which were shared with this caption: "In bed, in lift and in the Alps. You do get more than you can ski... with my lil one on a lil holiday." 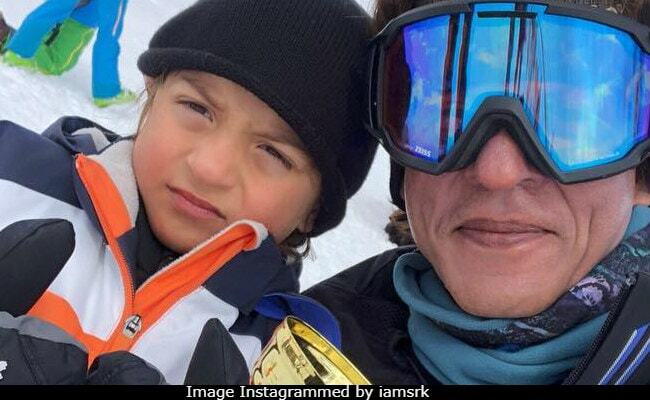 Earlier this week, Gauri Khan shared a similar photo of Shah Rukh and Abram from the Alps and had the most adorable caption for it: "Snowmen," she wrote. Shah Rukh Khan and Gauri got married in 1991 and are also parents to nineteen-year-old Aryan and sixteen-year-old daughter Suhana. Aryan is studying films in California while Suhana is busy with school. Shah Rukh Khan's holiday is a break from the shooting schedule of Aanand L Rai's December release Zero, in which he co-stars with Katrina Kaif and Anushka Sharma.